As Bloggers Against Celebrity Authors founder and let’s say president, I see it as the kid lit equivalent of the four horsemen of the apocalypse when the Children's Choice Book Awards Author of the Year is Rush Limbaugh. I'm sure that there are and will be many thoughtful articles about what happened to make the winner of a prestigious children's literature award for Rush Revere and The Brave Pilgrims: Time-Travel Adventures With Exceptional Americans. But all I can say is, "Dear God, what have we done?" The power of the bestseller was a slippery slope for children's literature awards. Certainly the power of the celebrity author - with their top budget promotions and guaranteed WalMart shelf space - was enough for a snarky online cause like Bloggers Against Celebrity Authors. But now, we've added to this mixture the nebulous and sometimes nefarious power of the Internet, which allows anyone to vote for this now-less-prestigious award. There is no way - NO WAY! - that children voted for Rush Limbaugh over Rick Riordan or Veronica Roth. 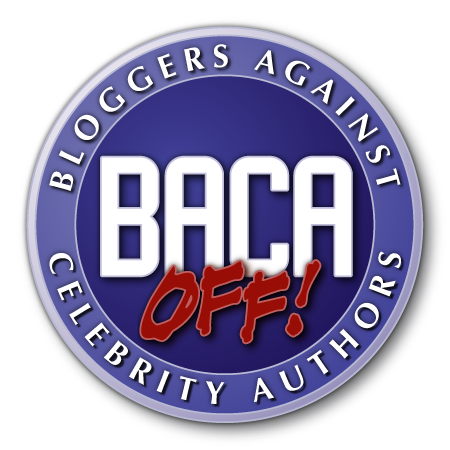 I'll let cooler heads prevail on what happens next, but for what it's worth BACA's back! Though perhaps, a little too late. Rush Limbaugh? Are you kidding me? I'm not touching the whole Rush Limbaugh/celebrity author thing. I'm not touching the quality of his book, which I haven't even seen anywhere. What I find interesting is that, if I understand the situation correctly, this award is, pretty much, for bestsellers, sales figures being how popularity is judged here. If that's how the short-list is created, and the world can vote for what they like best from the short-list, well, then, aren't you always going to get a lot of the same old same, old names winning, just because of name recognition? I know Rush isn't the same old, same old in children's literature, but he sure has name recognition. Awards are odd things, anyway. This is a particularly odd one.